Saute red chiles in olive oil in a skillet over medium heat for 2-3 minutes or until tender. Add garlic; cook and stir for 1 minute. Stir in tomato paste and water. Bring just to a boil; cook and stir tomato mixture until slightly thickened. Reduce heat to low. Add shrimp; cook and stir 1-3 minutes longer or until heated through. Place flatbread on a baking sheet. Top with shrimp sauce, spreading sauce 1/2 inch from edges. 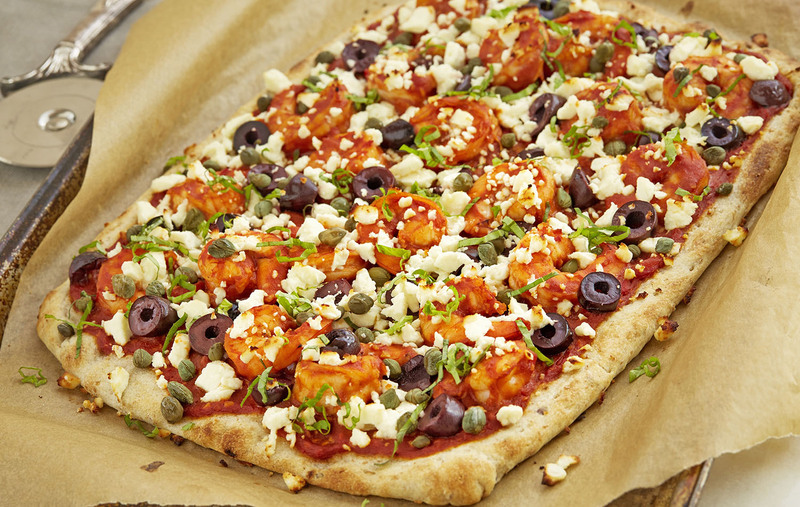 Layer with olives, feta, and capers. Season with salt and pepper. Bake for 10-12 minutes until warmed through and cheese begins to brown.